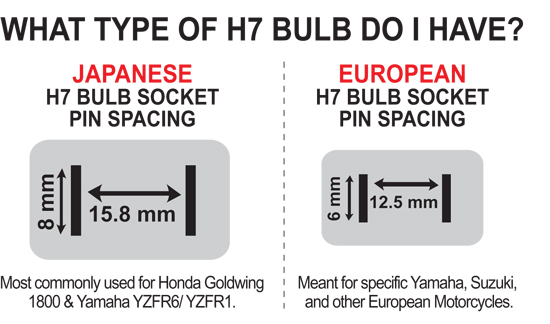 Examples of motorcycles with Dual H7 Headlights: Do you have Dual H7 Headlights? To install your Plug & Play™ Headlight Module and Dual H7 Harness adapter, under normal circumstances, all you need to do is essentially Plug & Play™! To begin, locate your headlight connector(s), this may require some disassembly of your fairings. Next you will need to simply disconnect your existing headlight plug(s). Now take the your motorcycle headlight plug (left plug for dual headlights and secure the unused right plug aside) and connect to the black harness adapter plug, then connect the opposite end of the harness adapter to the back of your headlight plug(s). Connect the 6 pin male connector from the adapter harness to the 6 pin female connector on the Plug & Play™ Headlight Module (this connector is polarized so it can only connect one way). Once everything is connected you will need to mount the optic sensor (grey or black wire with a photo eye on the end). We recommend mounting the optic sensor in a water protected area facing the road. Under the fairing pointed at the front fender is usually a good location. It is very important that the optic sensor is not facing toward the sky or directly at oncoming traffic, as headlights and street lights at night may cause the headlight module to activate. For those who would like a more permanent installation of the "Day Light Sensor", a 5/16 hole can be drilled into fairing. Otherwise, it can be secured to one of the bikes wires or cables with the zip tie. If you would like to utilize the "Heads-Up" Alert feature use the included blue tap splice connector to connect the green wire from the harness adapter to the bike’s horn wire. The bike’s horn wire is the wire that connects the bike’s horn button to the bike’s horn. Note: there only two wires on the horn itself and one of them is where the green wire connects. Choosing the wrong wire will not harm the module or the bike in anyway; The Heads Up Alert feature just will not work. To finish up, mount the Headlight Module with the enclosed adhesive pad and secure all wiring in a manner that will not interfere with any of the bike’s controls. To test the module use an incandescent light source or move outdoors during the day - fluorescent shop lights and LED lighting will not activate the module. The module is great and does exactly as advertised. Shipping was good. A little disappointed in the harness. It didn't occur to me that this was a generic part and not made specifically for my Goldwing. I guess I should have paid more attention. Found the harness a little bulky and the wiring too long for my application. Did manage to tie excess out of way. Feel much more confident on the highway and at intersections with the headlight strobing away. Had one concerned driver pull into a service station to tell me my headlight was flashing, he was worried I was going to be stranded on the highway somewhere. Very simple plug-n-play installation. I have not ridden it enough to see how well the downward facing light sensor will work. Another manuf of a similar product has the sensor pointing upwards. Time will tell. If you want to be noticed and stand out in traffic, the headlight module will do the job. Easy to install. Signal Dynamics shipped my order right a way and kept me updated by providing a tracking number. Works a as advertised. The 1800 is hard to get your hands into to install the plugs, but the directions are good, and its not difficult. I think another 2 inches of wire would be a help, but thats not a necessity. I would purchase the unit again. These modulators make you noticed for sure.